"ez-toc-section" id="Are-pre-workout-supplements-legal">Are pre-workout supplements legal? leash maximum GAINS? The best pre-workout supplements can help you get there. One of the most popular sports nutrition categories, Pre-Workout supplements seem simple at first glance: Take them before you hit the gym to train harder than you could without them. In the past, Pre-Workouts were that simple. But today’s pre-workout supplements are far more advanced, and target performance pathways beyond just muscle power — including motivation, focus, hydration, anabolism, circulation and more. Thanks to these advancements and breakthrough stack strategies, Pre-Workouts’ potential is more massive than ever — but also more confusing than ever. This guide is written to help you understand how pre-workout supplements work, what ingredients they use and how to take them most effectively. We’re also detailing 5 of the best pre-workout supplements of all time. Let’s get to it! How Do Pre-Workout Supplements Work? What is the best time to take a pre-workout supplement? What are the best pre-workout supplement ingredients? Do pre-workout supplements have side effects? Awesome ingredient combo: l-citrulline Dl-malate, creatine monohydrate, acetyl l-carnitine, red beet root extract, etc. Scroll down for details on these top-notch pre-workout supplements or click here to read all Best 5 Supplements pre-workout reviews. As the name implies, pre-workout supplements (also called “pre-workouts” for short, or PWO for even shorter) are products which bodybuilding and fitness enthusiasts take prior to their training. Pre-workouts’ primary goals are to improve performance and enhance cognitive function for workouts. Whether your exercise session takes more than an hour to complete or it has a high intensity, taking pre-workout supplements should help you conquer your workouts. Nowadays, the best pre-workout supplements also help increase muscle pumps, torch fat, and increase muscle mass – their repertoire, versatility, and potency are a lot more impressive than the pre-workouts of old. Long story short, men and women can choose from a wide array of pre-workout supplements right now. The best way to answer this question is to to delve deeper into the types of pre-workout ingredients. Since they produce different effects, they can give you an idea of how a typical pre-workout supplement can work to your advantage. On that note, many modern pre-workouts combine ingredients geared toward physical performance and cognitive enhancement – two factors critical for a hard and grueling workout. Pre-workout supplements energy and muscle performance benefits help power training intensity. Pre-workout supplements help increase energy levels, which, in turn, boost exercise performance. However, some men and women prefer pre-workouts without caffeine, one of the most popular energy boosters, because they help them perform grueling workouts without jitters. Most individuals who take pre-workout supplements do so to help boost their workout and sports performance. Whether they do strength training (anaerobic), running (aerobic), or some other form of exercise, they want a product which helps them progress and build on their personal records. Pre-workouts can do all that in more, with a class of nutrients that can be considered as performance boosters. In addition, performance boosters work by ramping up energy levels and delaying the onset of exercise fatigue. In pre-workout supplements, they are used to prime, power and protect muscles in many ways. Some of these performance-enhancing ingredients include taurine, creatine, citrulline malate and beta–alanine. Also known as stimulants, these ingredients help support cognitive function. More specifically, they help enhance mood, focus, attention, and energy — all of which can help you achieve greater mental and physical intensity during training. The most popular “cognition booster” used in pre workout supplements is probably the stimulant caffeine. This ingredient helps boost mental function, although it may produce a spike-crash and/or jittery effect in some individuals. Other popular stimulants in pre-workouts include theobromine, yohimbine, and ginseng. Pre-workouts with brain-boosting nootropics can help with the focus, concentration and drive needed for proper for and explosive lifting power. Pre-workout supplements also help increase levels of nitric oxide in the body. This compound helps improve blood flow, regulate blood pressure levels, and support nutrient uptake. Nitric oxide boosters’ most popular benefit is their ability to increase muscle pumps (a tight and swollen sensation one feels in his or her muscles while doing strength-training exercises). 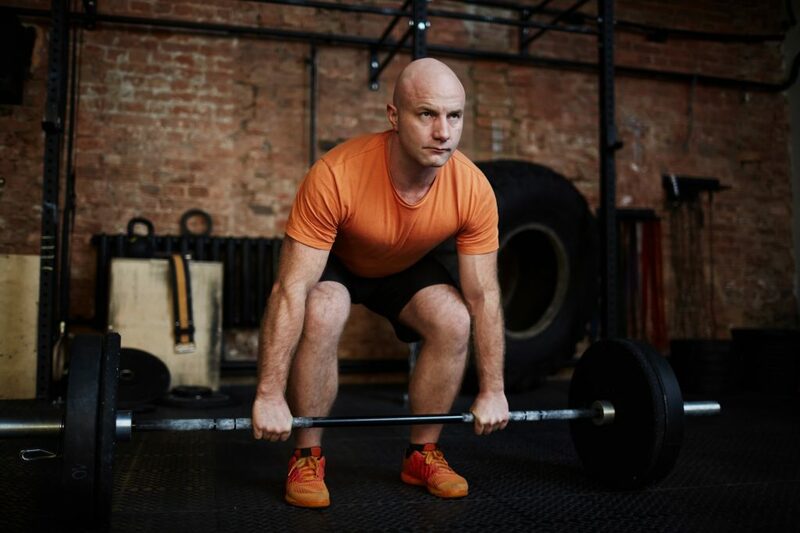 Beyond the motivating look of pumped-up muscles, it seems like better muscle circulation also helps oxygenate muscles, clear away waste products (like fatigue-inducing lactic acid) and helps deliver other sports nutrients you may be taking. Hydration is an important part of healthy training and peak muscle performance. However, you can only carry so many sports drinks while in the weight room. Some pre-workout supplements include hydrating factors inside their formulas, which help the body to maintain ideal hydration and electrolyte levels, especially during intense sessions involving a lot of sweat. Salt is a leading pre-workout ingredient for helping with hydration during training. As a bonus, salt helps the body to absorb and utilize many of the amino acids found in pre-workout supplements. Salt is simple, but its ability to make water and sports nutrition work better make it an ideal pre-workout mineral. 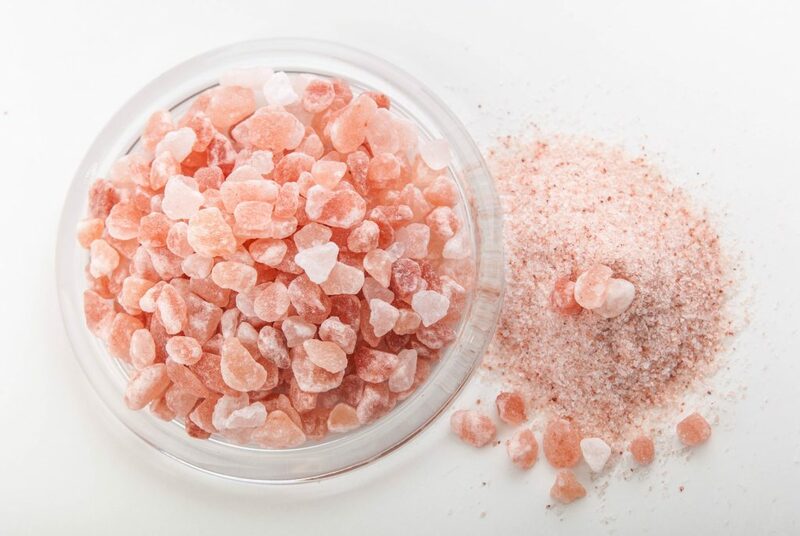 Himalayan pink salt is the form used by the best pre-workouts; it supplies bonus trace minerals like calcium, magnesium and potassium. Many pre-workouts also act as thermogenics to help make them an attractive option for fitness enthusiasts. Buying a product which not only improves performance, but also burns fat makes it a practical supplement from top to bottom. These fat-burning pre-workouts aim to use fat utilization as a vital source of energy. Among the more common thermogenics used in pre-workout supplements are conjugated linoleic acid (CLA), green tea, and green coffee bean extract. For maximum fat loss activity, it is smart to stack a pre-workout with a quality, dedicated fat burner supplement, which is more likely to hit effective dosages. Some pre-workout supplements also make it easier for individuals to gain muscle mass. They do this by increasing muscle protein synthesis (MPS) and keep muscle protein breakdown (MPB) in check. The most common muscle-building ingredients in pre-workouts are creatine and branched-chained amino acids (BCAAs). The latter component includes leucine, the so-called “most anabolic amino acid” because of its ability to kickstart the MPS process. Modern pre-workout supplements do more than just maximize energy levels and the like – they also help boost recovery. Some pre-workout supplements include components such as BCAAs and creatine help shorten recovery time for better results. Another aspect of recovery is protecting muscles, often with antioxidant compounds. Of course, there is also an entirely separate supplement category dedicated to recovery, specifically — post-workout supplements — but a pre-workout can help give you a head-start on recovery. The ultimate goal of pre-workout supplements’ multiple benefits: GAINS. In formulas that have stimulant ingredients and are designed for sensory, motivating, energizing benefits, take the pre-workout 30 minutes before you start training. That is the right starting point; assess how you feel while working out and adjust your timing accordingly. Beetroots’ high nitrate content helps the body use oxygen more efficiently during intense training. 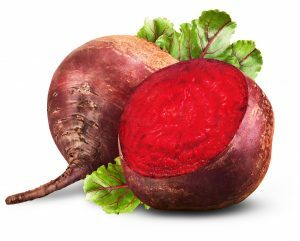 Beetroot: Many pre-workout supplement manufacturers are using this ingredient because of its high nitrate content. Experts believe this results in the muscles’ lower energy expenditure, allowing one to exercise longer and harder. Plus, beetroot is known for its ability to regulate blood pressure levels. Astragalus: An herb which functions as an adaptogen (a natural substance which helps improve adaptability to stress). Astragalus also helps keep lactic acid and ammonia levels in check for increased exercise endurance. 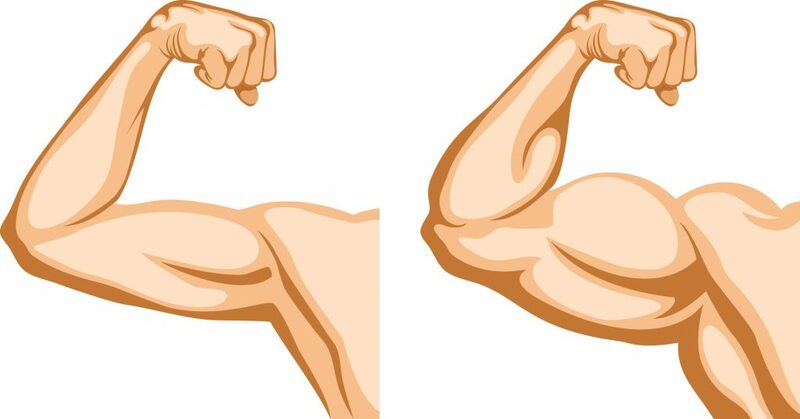 Plus, fitness experts believe astragalus helps boost immunity and increase muscle pumps. Rauwolscine: This ingredient, a by-product of the Rauvolfia plant, helps regulate blood pressure levels, improve circulation, ramp up fat burning, and increase adrenaline. Ginseng: This plant helps ward off fatigue, shorten recovery time, and boost cognitive function. Theobromine: An alkaloid compound found in many cocoa products. Some pre-workout supplements use theobromine in lieu of caffeine due to the former’s milder stimulant effects. Some fitness experts believe theobromine helps enhance mood and boost blood flow. Yohimbine: An alkaloid and by-product of a small African evergreen tree which may help improve exercise performance. However, yohimbine is better known as a libido-booster. BCAAs: Branch-chained amino acids are the essential amino acids leucine, isoleucine, and valine. They help increase muscle protein synthesis, burn fat, delay the onset of exercise fatigue and keep muscle soreness at bay. Leucine: The most anabolic amino acid which helps kickstart the muscle protein synthesis process. Leucine does this by activating a special protein known as mTOR. Some fitness experts believe leucine can also preserve muscle mass and incinerate fat. Taurine: An amino sulfonic acid which helps increase the muscles’ capacity to retain water for a fuller, muscular appearance. Taurine also helps keep oxidative stress at bay, improve exercise performance, boost recovery, torch fat, increase testosterone levels, and boost heart and brain health. Arginine: This amino acid acts as an ergogenic aid because of its ability to ramp up nitric oxide (NO) levels for improved blood vessel dilation and blood flow. These result in enhanced performance, shorter recovery time, and improved nutrient uptake. Beta-alanine: Some fitness experts hail beta-alanine as one of the best pre-workout supplement ingredients because of its muscle endurance-boosting prowess. Beta-alanine helps synthesize carnosine (muscle compound that improves buffering capacity). Creatine: Another popular pre-workout supplement ingredient. Creatine is an organic acid which supplies the muscles with energy (ATP) during intense exercise. It also helps increase muscle mass, improve power output, and ramp up anaerobic and aerobic capacity. CLA: Conjugated linoleic acid is a fatty acid which helps burn fat and retain muscle mass. CLA’s fat-burning prowess stems from its fatty acid oxidation via carnitine palmitoyl transferase simulation. Citrulline malate: This is a combination of the amino acid citrulline and malate, a key part of the Krebs cycle (which helps increase energy levels). The former is another precursor of nitric oxide (NO). Citrulline malate helps shorten recovery time, increase creatine synthesis, ward off fatigue, and enhance muscle function. Vitamin B12: Also known as cyanocobalamin, Vitamin B12 helps increase energy levels and boost cardiovascular health. Vitamin C: This vitamin’s ability to ward off the common cold is arguably its most popular benefit. However, Vitamin C (also known as ascorbic acid) also helps regulate blood pressure levels, ward off free radicals, and boost eye and heart health. 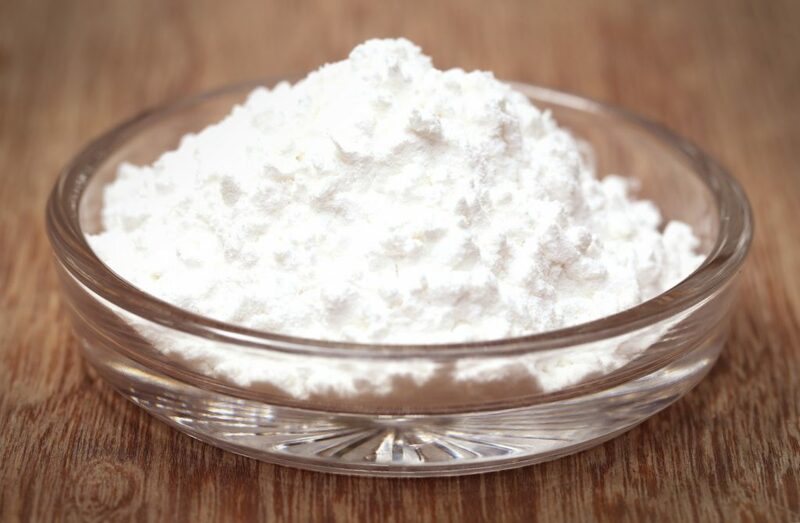 Baking soda: Also known as sodium bicarbonate, this ingredient helps keep lactic acid buildup in check. This, in turn, results in greater resistance against fatigue. Salt: Otherwise known as sodium chloride, salt helps maintain healthy electrolyte levels in the body for better hydration and faster recovery. Salt also helps ward off muscle cramping. Baking soda has been getting a lot of buzz as a pre-workout lately, mainly because it’s cheap and it WORKS. Betaine: This ingredient is part of the methionine cycle, which produces S-adenosylmethionine (SAM). The latter component helps produce protein, creatine, and other molecules which help improve exercise performance. Betaine may also help boost muscle protein synthesis. Caffeine: The undisputed most popular stimulant among men and women who purchase pre-workout supplements. Caffeine helps improve exercise performance, enhance mood and reaction time, and delay the onset of fatigue. It helps keep adenosine (a neurotransmitter which makes one feel sleepy) levels in check while increasing levels of neurotransmitters which help boost adrenaline. Cordyceps: This refers to a group of fungi which helps keep fatigue at bay and increase exercise endurance. Cordyceps is also used in testosterone supplements, including some of our favorite T-booster stacks of 2017. Glycerol: A triglyceride which helps the body retain more water and consequently, improve hydration. Furthermore, some experts believe glycerol can help enhance muscle pumps. Nitric oxide: A popular bodybuilding supplement ingredient which helps boost circulation, dilate blood vessels, and increase muscle pumps. Nitric oxide also helps improve nutrient uptake to the muscles for faster recovery. Agmatine sulfate: This ingredient is the salt from of agmatine (an aminoguanidine present in tissues and organs) and is a derivative of the amino acid l-arginine. Some experts believe agmatine sulfate helps boost nitric oxide levels for increased muscle pumps. Alpha GPC: Also known as l-alpha glycerylphosphorylcholine, Alpha GPC is a natural choline compound derived from soy lecithin. It produces choline, a precursor of the neurotransmitter acetylcholine which plays a key role in muscle contraction and may increase human growth hormone (HGH) levels. Read more about leading pre-workout supplements on our Best Pre-Workout Supplements of 2017 list. p>Pre-workout supplements are safe provided one takes them in the dosages which their respective manufacturers prescribed. Overdosing is never a good option, as side effects may kick in. However, pre-workout supplements contain stimulants like caffeine and other ingredients such as yohimbine which are not compatible with some individuals, depending on the user. You don’t have to be an expert, but it’ still best to learn about what these pre-workout ingredients can do. If you are thinking of purchasing a pre-workout supplement, it’s always a good idea to consider your personal medical history and always consult with your physician before making a decision on a supplement. Caffeine: May produce a spike-crash and/or jittery effect in some individuals. Beta-alanine: May result in the so-called “Beta-alanine itch” which is a tingling or flushing sensation felt on the skin after consumption. Experts believe the stimulation of nerve endings underneath the skin is the underlying cause. Yohimbine: Could raise blood pressure levels, increase anxiety, induce abdominal discomfort, and cause kidney issues. Salt: May raise blood pressure levels if taken in excess. Experts believe these side effects may increase the longer an individual takes pre-workout supplements. Because of this, some people cease consumption of pre-workouts. Other individuals “cycle” them by not taking them for a few weeks or months before taking them again. Doing this also keeps caffeine tolerance in check. Many pre-workout supplements are legal. Pre-workouts with proven ingredients like branch-chained amino acids (BCAAs), leucine, creatine, taurine, caffeine, sodium chloride, beetroot, citrulline malate, and the like are safe for consumption for most fitness enthusiasts. However, some pre-workout ingredients such as 1,3-dimethylamlamine (more commonly known as “DMAA“) are banned in Canada, Brazil, and Australia. DMAA is intended to increase performance and burn fat. However, some experts believe it elevates blood pressure levels and may cause heart issues. The simple takeaway: as long as your pre-workout supplement is in your local vitamin store’s shelves, it is most likely legal. If you are in doubt, it’s always best to do extra research – try reaching out to your local government’s food and drug agencies to dwell on the safe side. The more facts you discover, the better. p>For general information on purchasing high-quality supplements, please check out the Best 5 How to Buy a Good Supplement guide. Versatility – Like we said, modern pre-workout supplements also help torch fat, increase muscle mass, shorten recovery time, etc. Plus, we seek manufacturers which have a strong online presence and favorable reputation among consumers. When a manufacturer meets these criteria, it has a greater chance of standing behind its products. Proof of this is its Smart Caffeine combo of caffeine and l-theanine – the latter helps offset the possible side effects of the former. With 4 Gauge’s six grams of l-citrulline Dl-malate leading the charge, your workouts will never be the same again. L-citrulline Dl-malate, 6,000 mg: 4 Gauge’s main ingredient which helps ramp up nitric oxide levels for increased muscle pumps, improved blood flow, healthier blood pressure levels, and better nutrient uptake. Creatine monohydrate, 1,000 mg: The most effective brand of creatine on the market. Creatine monohydrate helps increase muscle mass, increase athletic performance, and delay the onset of fatigue. Acetyl l-carnitine (as acetyl l-carnitine HCl), 500 mg: An amino acid which helps increase fat loss and keep fatigue at bay. Red beet (Beta vulgaris) root extract, 300 mg: The second of 4 Gauge’s two potent nitric oxide boosters. In fact, it’s one of the unique pre-workout supplements which has beetroot, an ingredient which is also known for its ability to regulate blood pressure levels. Coconut water powder, 300 mg: An electrolyte source which is rich in potassium, vitamin C, and B vitamins. It helps increase hydration and maintain healthy blood pressure levels. It’s rare for a pre-workout to have coconut water. On that note, 4 Gauge veers away from the norm to build on its unique identity. L-theanine, 200 mg: This represents the first half of 4 Gauge’s unique “Smart Caffeine” combination. This amino acid, which is found in tea leaves, helps you “relax, rejuvenate, and focus,” per the manufacturer’s official website. Caffeine anhydrous, 150 mg: The manufacturer claims this ingredient not only increases adrenaline, but also ramps up muscle endurance and strength. This is because caffeine helps offset glycogen depletion by encouraging the body to utilize fat as a fuel source. Rhodiola rosea (root) powder, 100 mg: An herb which helps enhance mood and focus prior to a tough workout. This is another rare pre-workout ingredient which you can only find in 4 Gauge. 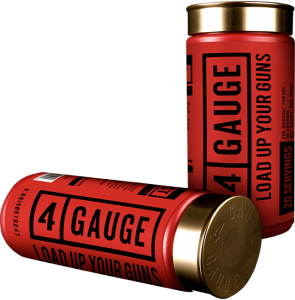 Impressive formula: 4 Gauge’s utilizes a blend of proven and rare pre-workout ingredients to give you the best possible results. Has two potent nitric oxide boosters in l-citrulline Dl-malate and red beet root extract. One gram of creatine monohydrate per serving: Helps increase muscle mass and athletic performance. 4 Gauge includes several sugar alcohols like erythritol and xylitol. While this is no cause for alarm (sugar alcohols have a low glycemic index rating and don’t cause massive blood sugar spikes), it would have been better if the manufacturer used monk fruit extract exclusively. Finally, this pre-workout supplement doesn’t come cheap – one 280-gram container costs $45.00 — and it is not available on Amazon. Long story short, 4 Gauge is one of the most potent and unique pre-workout supplements of 2017 and beyond. If you refer to any supplement review guide, make sure to look this one up – it packs a serious wallop. Expect to increase your power, focus, and energy without the dreaded crash and jitters (thanks to 4 Gauge’s awesome “Smart Caffeine” content). 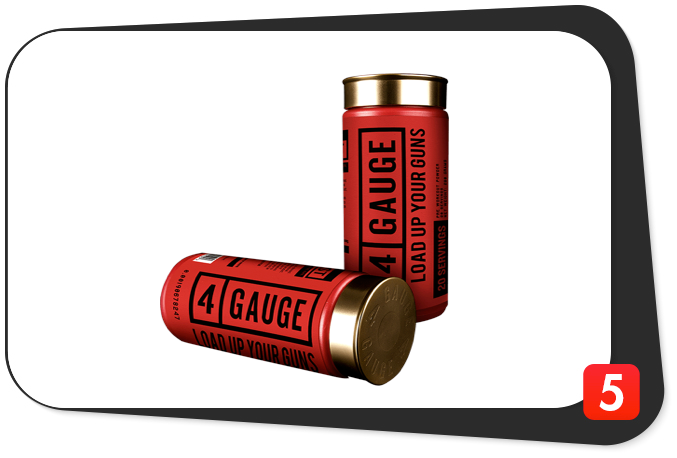 Make no mistake about it, 4 Gauge sets the bar high. When buying a pre-workout, make sure to put this high on your priority list. 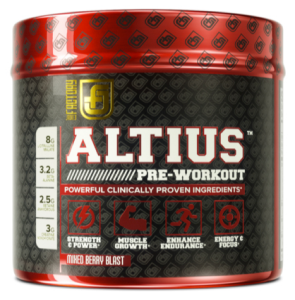 ALTIUS utilizes a well-rounded pre-workout formula with clinically-effective doses and clean ingredients, making it a powerful force among PWOs. The Core Performance Blend (which features 325 mg. of caffeine anhydrous per serving) is a the forefront. ALTIUS is one pre-workout which will jack you up for sure. Citrulline malate, 8,000 mg: ALTIUS supplies your body with an insane eight grams of citrulline malate per serving. This much is sure to help you keep fatigue at bay and shorter recovery time. You can also expect better blood flow, more muscle pumps, healthier blood pressure levels, and improved nutrient delivery. Beta-alanine, 3,200 mg: A naturally-occurring beta amino acid which helps increase muscle buffering capacity for greater endurance. The manufacturer also says beta-alanine helps ramp up strength and power as well as increase muscle mass and torch fat. Creatine monohydrate, 3,000 mg: A popular and proven ingredient which helps increase muscle mass, strength, power, and endurance. 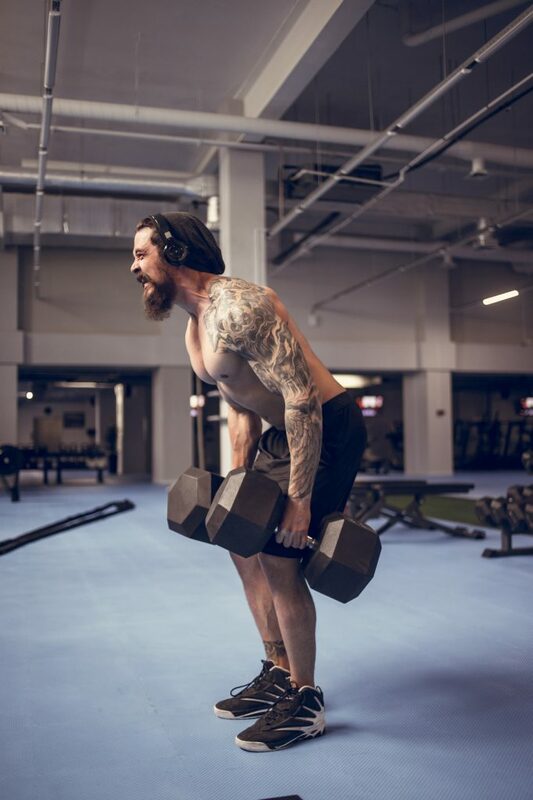 In addition, ALTIUS’ three grams of creatine monohydrate per serving can help you gain as much as 30 percent in “power and energy release in short-sprint range,” per Jacked Factory’s official website. Betaine anhydrous, 2,500 mg: An ingredient which helps increase strength, power, muscle mass, endurance, protein synthesis, and human growth hormone (HGH). Clearly, it’s one of ALTIUS’ most versatile ingredients. Alpha GPC, 150 mg.: This is a soy lecithin by-product which helps increase performance. Some experts believe it can also ramp up HGH levels. BioPerine, 5 mg.: Also known as black pepper fruit extract, this ingredient helps improve nutrient absorption for better overall results. Methylcobalamin, 500 micrograms: Simply known as Vitamin B12, this component helps increase alertness and energy. It also helps regulate the immune system. The manufacturer says it included methylcobalamin – the best form of Vitamin B12 on the market with a great absorption rate – “because it stacks very well with caffeine and Alpha GPC.” We agree. Excellent ingredient combination: features some of the best components. Clinically-dosed ingredients: manufacturer uses doses used in clinical and scientific studies. Great design: unique pre-workout formula sets it apart from the rest of the pack. Clean ingredients: no fillers and artificial food colorings whatsoever. The manufacturer uses natural sources such as stevia and beetroot for more health benefits. Goes above and beyond the call of duty: it’s not merely a pre-workout supplement; it can also help increase muscle mass and shorten recovery time. Great reputation: consumers have given the product very good reviews online. The first noticeable chink is the high caffeine amount (325 mg. of caffeine per serving) – that’s more than twice the caffeine content of a regular cup of coffee. Individuals who are sensitive to caffeine should skip this one. We initially said the price was a bit high ($49.99) for a 406-gram container. However, the manufacturer has slashed the price to a more reasonable $35.99 since then. 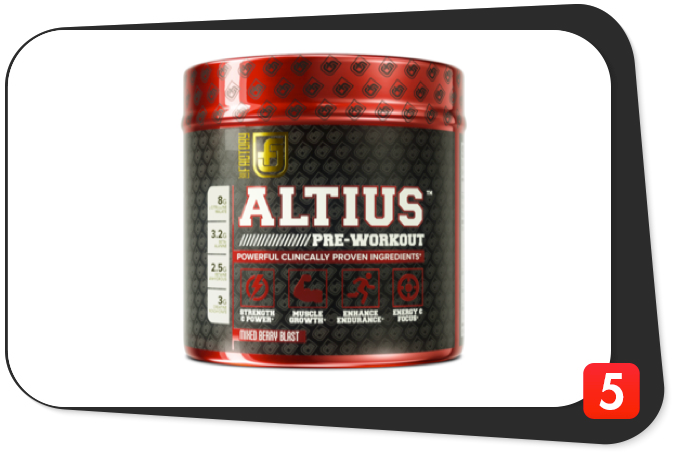 When we reviewed ALTIUS by Jacked Factory, we said it is “one of the best PWOs we’ve reviewed.” However, it became our top rated pre-workout in 2016 and 2017. Powerful, clinically-dosed, versatile, and clean pre-workout ingredients should help take your workouts to the next level. These sum up the reasons why ALTIUS by Jacked Factory is one powerhouse pre-workout many have recommended. Check it out in our Best 5 Pre-Workout Supplements of 2017. 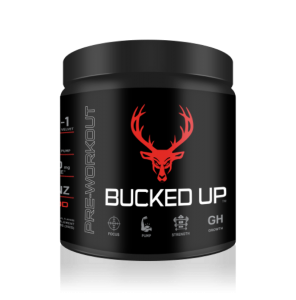 DAS LABS’ Bucked Up “was developed with one purpose in mind – to take your workouts to the next level and to be the best possible pre-workout on the market,” per its official website. 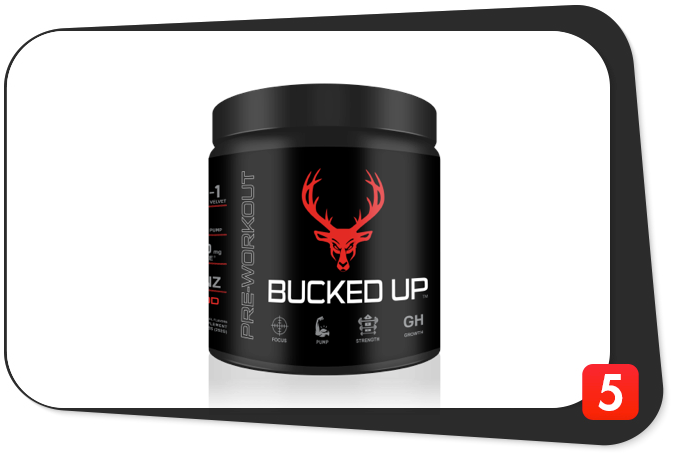 Bucked Up’s 200 mg. of caffeine per serving plus three growth hormone potentiates are ideal for anyone who wants to boost energy levels, increase muscle mass and pumps, and achieve his or her fitness goals. Citrulline Malate 2:1, 6,000 mg: Helps improve blood flow and regulate blood pressure levels. It also helps increase nutrient uptake, exercise capacity, and muscle pumps. Beta-alanine, 2,000 mg: When you consume beta-alanine, you increase your muscles’ buffering capacity, which, in turn, results in the ability to ward off fatigue. Caffeine anhydrous, 200 mg: DAS LABS Bucked Up’s 2oo mg. of caffeine anhydrous per serving is roughly equal to two cups of Joe. AlphaSize Alpha GPC, 200 mg: Helps enhance muscle performance and growth. Some fitness experts believe Alpha GPC may ramp up human growth hormone (HGH) levels. Taurine, 100 mg: A versatile amino sulfonic acid whose muscle water-volumizing capacity is similar to creatine’s. Taurine also helps keep oxidative stress at bay, improve exercise performance, support testosterone and boost cardiovascular health. Folate (folic acid), 200 mg: Simply known as Vitamin B9, this ingredient helps regulate cholesterol levels and boost overall cardiovascular health. Deer antler velvet extract, 50 mg: Has calcium, magnesium, zinc, amino acids, and anti-inflammatory agents known as prostaglandins. Experts believe deer antler velvet extract helps increase focus, regulate the immune system, and shorten recovery time from injury. AstraGin, 25 mg: This refers to a potent combo of ginseng and astragalus extracts which helps enhance amino acid absorption. We think it’s a great inclusion in DAS LABS Bucked Up. ActiGin, 25 mg: This ginseng and rose hips combo helps keep inflammation at bay and increase endurance. It should work well in tandem with this product’s deer antler velvet extract component. Great ingredients: it’s rare to stumble upon a pre-workout supplement which has folic acid, Himalayan rock salt, deer antler velvet extract, AstraGin and ActiGin. Smart formulation: goes above and beyond its intended purpose of enhanced energy levels (additional nootropics and nutrient absorption boosters). Non-GMO/Gluten-free: natural ingredients back up this claim. Great transparency: manufacturer divulges all of the ingredient amounts . Awesome reputation: customers swear by this product. Great taste: one of the best-tasting pre-workout formulas on the market today. DAS LABS Bucked Up includes some questionable ingredients such as silicon dioxide and the artificial food coloring FD&C Red No. 40 in its Blood Raz flavor. Some experts have linked the latter to carcinogenicity. Plus, DAS LABS Bucked Up doesn’t come cheap: one 300-gram container costs roughly $49.95. DAS LABS Bucked Up is a unique pre-workout supplement which combines the traditional PWO ingredients with natural components for increased energy, muscle pumps, and more. Without a doubt, the star of the show is six grams of Citrulline Malate 2:1 per serving. We feel this is the product’s unique selling point. DAS LABS Bucked Up will exceed your expectations. Count on it. PULSE by Legion is one straightforward pre-workout supplement. First, it has the traditional pre-workout ingredients (l-citrulline malate, caffeine, beta-alanine, and betaine). Second, the manufacturer claims PULSE does everything what a great pre-workout supplement does “without the unwanted side effects or crash,” per its official website. Add everything up, and you get a pre-workout you should not only be buying, but making a permanent part of your healthy lifestyle. L-citrulline Dl-malate, 8 g: PULSE gives you one of the highest l-citrulline Dl-malate content of any pre-workout supplement at a whopping eight grams per serving. That much is sure to help you increase your muscle pumps and vascularity. Beta-alanine, 4.8 g: Helps increase intensity and boost endurance. When you consume beta-alanine, you increase your muscles’ buffering capacity for greater resistance against fatigue. PULSE’s relatively high beta-alanine content will most likely result in the “beta-alanine itch”(a tingling sensation underneath the skin due to the stimulation of nerve endings) in some individuals. Be ready. Betaine anhydrous, 2.5 g: Helps increase metabolism and boost performance. In addition, some fitness experts believe betaine plays a key role in protein synthesis for more muscle mass. L-ornithine HCL, 2.2 g: This is an l-citrulline precursor which helps ramp up nitric oxide production for more insane muscle pumps, healthier blood pressure levels, and improved nutrient uptake. Plus, this ingredient helps keep fatigue at bay. Caffeine anhydrous, 350 mg: It turns out caffeine is more than just a pick-me-up. The manufacturer cites is ability to assist with weight management, while also enhancing strength, endurance and anaerobic exercise performance. L-theanine, 350 mg: This amino acid is found in tea. The manufacturer says the combo of caffeine and l-theanine helps keep stress levels in check, increase nitric oxide production, boost focus, and enhance mood. Has three nitric oxide boosters in l-citrulline Dl-malate, l-ornithine HCl, and the caffeine and l-theanine combo. Natural components: “No artificial sweeteners, flavoring, food dyes, or unnecessary fillers,” per manufacturer’s official website. However, keep in mind this pre-workout supplement is expensive – one 1.15-lb. container costs $39.95. 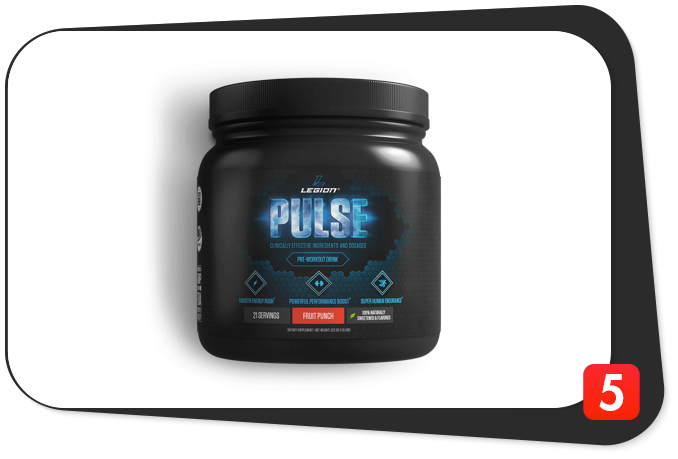 PULSE by LEGION is one of the best natural pre-workout supplements today. The key word here is “natural” – the manufacturer includes the traditional pre-workout ingredients and leaves out artificial components and fillers. 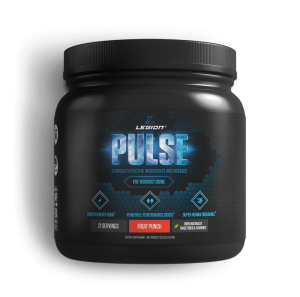 If you want an all-natural pre-workout, PULSE by LEGION is one of your best bets – it will give you solid muscle pumps, insane energy levels, and an awesome adrenaline rush. 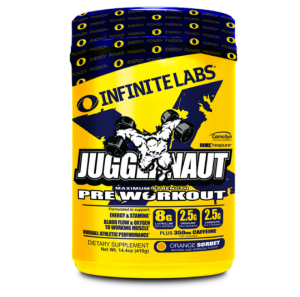 Juggernaut X by INFINITE LABS may not have emerged as B5’s top pre-workout supplement, but it makes a serious claim as the pre-workout with the best name. This product “is the ideal pre-workout supplement to support your training intensity, strength, muscular endurance, and stamina with amazing flavor options,” per its official website. Juggernaut X is not your typical pre-workout: it has additional doses of vitamins and minerals on top of its regular pre-workout ingredients. Vitamin C (as ascorbic acid), 396 mg: Juggernaut X has one of the highest Vitamin C content among pre-workout supplements at an insane 660 percent of the daily value (anything more than 15 percent is a high amount). Ascorbic acid – a potent antioxidant – helps regulate immunity and ward off nasty free radicals. However, the manufacturer maintains Vitamin C’s most impressive pre-workout benefit is its ability to keep cortisol (stress hormone) levels at bay. Vitamin B6 (as pyridoxine hydrochloride), 8 mg: This much represents an impressive 400 percent of the daily value for Vitamin B6, which helps regulate the nervous and immune systems. Folate (as folic acid), 300 mcg: Juggernaut X’s folic acid content is equal to a solid 150 percent of the daily value. Also known as Vitamin B9, this ingredient helps quell anxiety, boost heart health, and increase muscle mass. L-citrulline, 4 g: The manufacturer claims l-citrulline will help ramp up l-arginine and nitric oxide levels for increased vasodilation. Creatine monohydrate (Creapure), 1.25 g: This top-notch German brand of creatine helps increase muscle mass and increase performance. Beta-alanine (Carnosyn), 1.25 g: This ingredient is a precursor of carnosine, “one of the most powerful pH (acid) buffers known to operate in muscle during intense exercise,” per the manufacturer’s official website. L-tyrosine, 0.5 g: An amino acid which helps increase physical performance, per the manufacturer. Agmatine sulfate, 0.5 g: An ingredient which helps improve mental and physical performance. L-histidine, 250 mg: An amino acid which helps improve blood, nervous system, and joint health. Caffeine, 175 mg: “In addition to being a CNS stimulant, it has a variety of peripheral effects relating to muscle contraction, diuresis, gastric secretion, and lipolysis,” per the manufacturer’s official website. Good ingredient profile: l-citrulline, creatine monohydrate, beta-alanine, caffeine, etc. 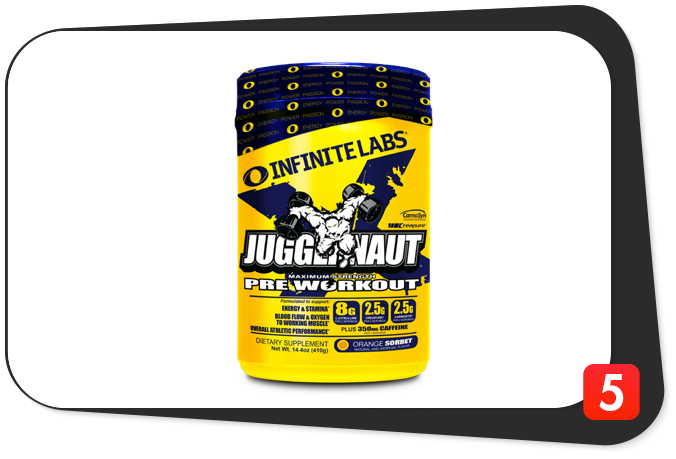 Juggernaut X by INFINITE LABS does not enjoy the sterling reputation of the other big-name pre-workout supplements. Plus, it’s a bit on the expensive side – one 410-gram container costs $32.79, per its official website. The good news: it’s the cheapest in B5’s Best Pre-Workout Supplements of 2017. >Pre-workout supplements can be a double-edged sword. In fact, fitness experts and consumers alike have scrutinized this bodybuilding supplement category more than any other every year, it seems. Not all pre-workout supplements are the same. Clearly, some are better – and safer – than others. As a result, it all boils down to doing your research as a consumer – you burn the midnight oil, your body will thank you for years to come. The pre-workouts in this list are all excellent and highly-recommended by Best 5 Supplements. Try building your progress on these for great results. On this note, check out our other B5 pre-workout reviews to expand your horizon even further. Who knows, you may stumble upon the next unheralded pre-workout superstar?